This is a summarized, web version of the report. To protect client privacy, there are several details of this investigation that are left out or cannot be discussed here. For the same reason, some of our evidence cannot be included on this site. Stationary Audio, Placed next to the sink in the kitchen for the entire investigation. Placed at Command Central for the entire investigation. All historical information and research is based on interviews with current owners of the property. · Built in 1901. The rest of the farm and most of the structures on the property (barns, sheds, etc.) were built around the same time period. 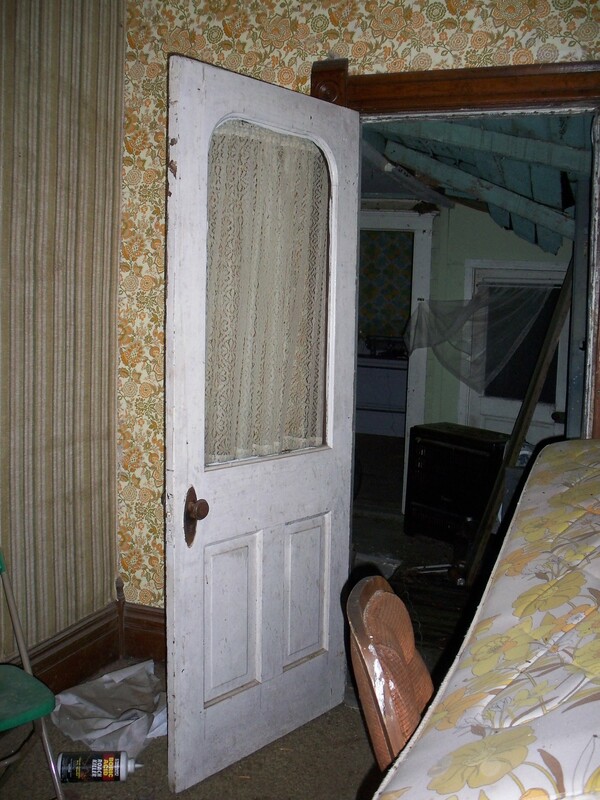 · According to records there was one death on the property in 1947. · Abandoned officially in 1983. From 1901 until then, the property was owned by the original family. 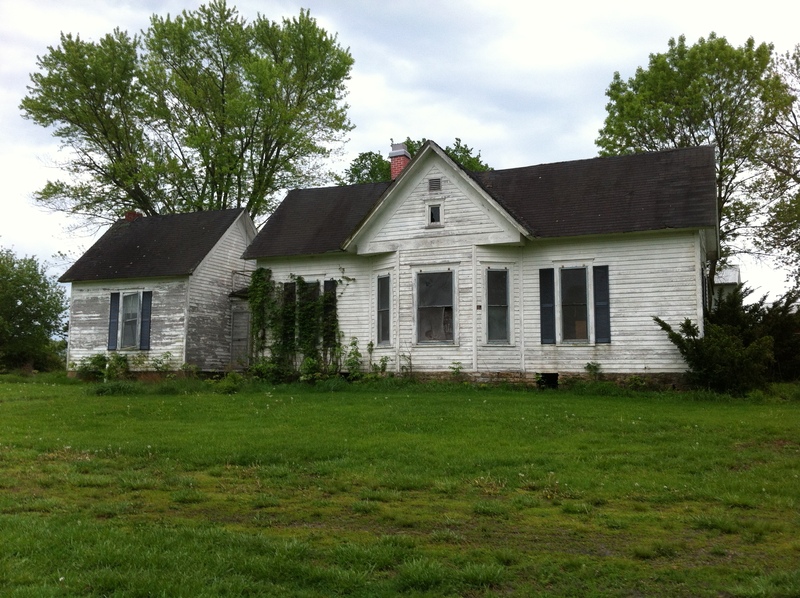 · The clients’ current home was built on the property around the same time the farmhouse was abandoned, early to mid-80s. · Nothing is known about the property before 1901. 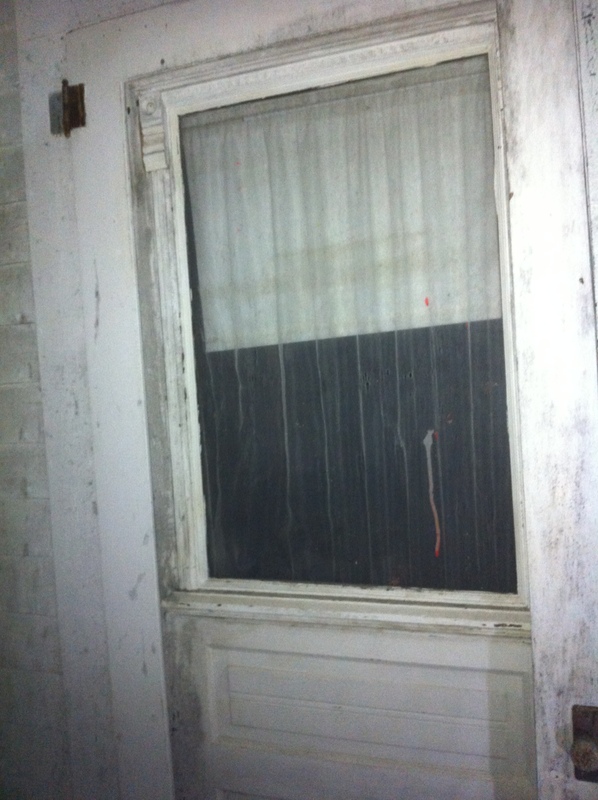 · Creepy feelings when the family is working around the farmhouse. Feelings of being watched from the house. 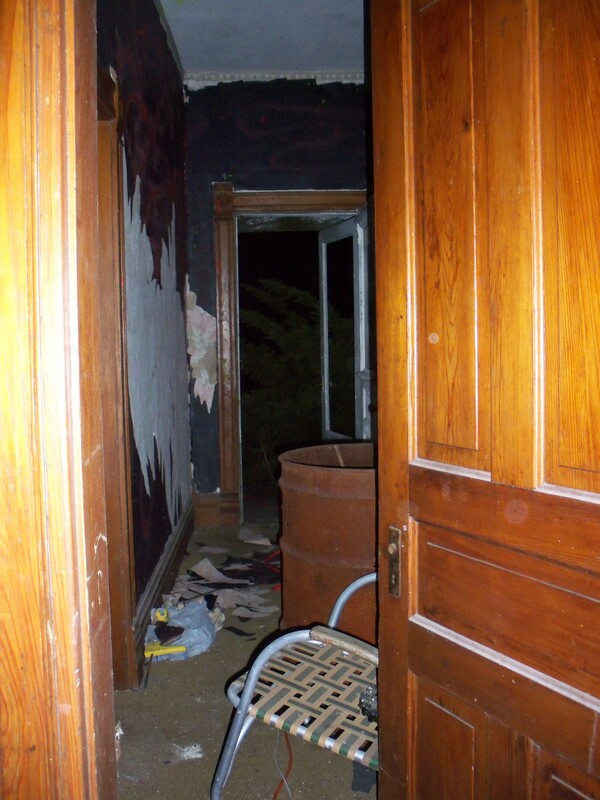 · One of the property owners feels particularly uncomfortable in the first room to the right from the front entrance/hallway. She felt a cold spot the first time she was in the room. For the remainder of the report this room is referred to as the “front room to the right” or the “cold room”. · Hearing whistles coming from inside the house. · Seeing someone in one of the windows. 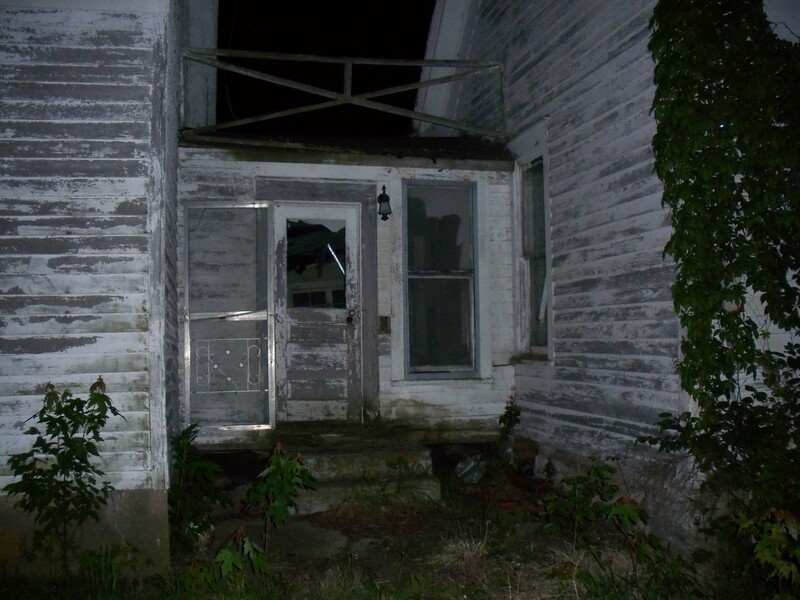 In reviewing all of the footage and evidence from the farmhouse, I learned a lot of things, specifically about being determined to spend the time and energy to find the real story behind what is heard or seen. In a place with lots of noises, it was very necessary. As far as the noises go, in some situations I had three versions of audio I could compare when listening to events or noises. In many of those cases, things sounded completely different depending on where in the house the recorder was. At the same time, sound travels very easily in the house. 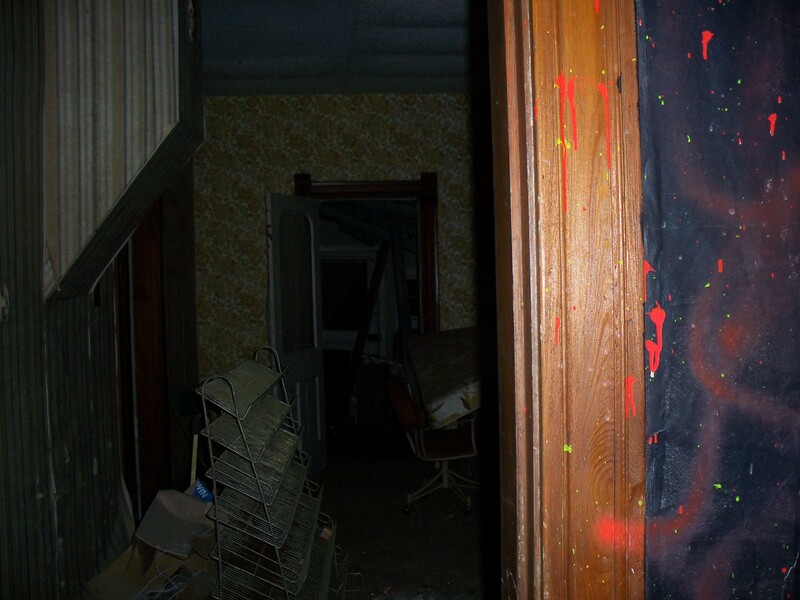 Something being whispered in the front part of the house was very likely to be heard in the very back part of the house or the kitchen, only it may have sounded like something else completely. Most of the sounds and events that I flagged while initially reviewing evidence could be explained after digging deeper into the files later. However, there are a few places where, at least at this time, I feel we could have legitimate EVP (electronic voice phenomena). I just haven’t yet come up with a good explanation for those situations. Unfortunately, due to unusual weather conditions, our DVR was unplugged on at least one occasion. We thought it was okay once it was plugged back in, but I had a lot of technical difficulties with the footage and was not able to view it. 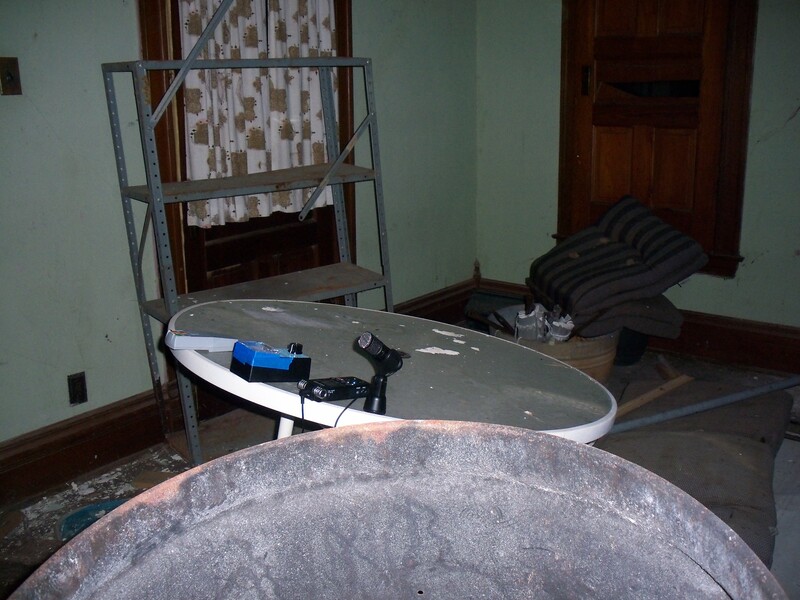 In my experience, the least common place to capture evidence of the paranormal is in this footage, but it may have proved helpful in debunking some of the activity or sounds we were hearing. At the same time, I don’t feel like this was very hurtful to our investigation or the results. And finally, as I state later in the report, I am still not entirely sure what to think about the results of our trigger music and K-II part of the experiment and my return visit. If the clients are interested, this could possibly be an ongoing investigation. Our first walkthrough after our arrival was at 6:19pm. Norman and I both noticed that it seemed chilly in the room off to the right of the main hallway (“cold room”). This is where one of our clients reported feeling a cold spot and just feeling uncomfortable in general. Because of safety concerns, we investigated this area before setting up equipment and before dark. We did end up revisiting a few times throughout the night, though. Bailey got a .2mG as we entered the kitchen and then it went away. At 7:37pm Cassie thought she heard a “clank” of some kind down in the basement. She described it as the flipping of a light switch. At 7:39pm Bailey and I went to the basement. While we were down in the basement, Norman and Cassie (above in the kitchen) mentioned hearing a rumbling sound coming from somewhere. We later discovered it was a big stove or some kind of appliance in the connection that reverberates (almost like a growl) when you walk near it. At 7:45pm Bailey got another .2mG. At 7:48pm Cassie said she got a “giant back spasm”. Her whole body convulsed, according to Bailey. EMF readings were a .1 and then a .2mG as we were asking if someone was with us and if they touched Cassie. At 7:48pm I left Cassie and Bailey to help Norman finish setting up. Cassie and Bailey began pre-investigation readings. For us, a "rest period" is just quiet time after all equipment is up and recording. During this time no investigators were inside the house. We stayed across the road. 5:15 – 6:15 (8:36 – 8:37pm) – Sounds like footsteps near the kitchen, a tap near the recorder, & a high pitched squeak at 5:44. 15:02 (8:46pm) – Shuffling/drippy noises? 23:20 (8:54pm) – Client getting home? 00:34:08 (9:04pm) – Shuffling, something shutting? 1:10:03 (9:40pm) – Taps, Shuffling/Bird? Bailey reported having a steady .2mG before even entering the house. After entering the house and spending some time in the front right room/”cold room”, Bailey again had a pretty constant .2mG for a while. At 9:48pm there is a massive amount of noise that was picked up in the PX-820, the stationary audio recorder next to the sink in the kitchen. We were in the front left room/”cold room” and did not hear it. It was also not picked up in the Tascam audio recorder that was with us at that moment. This tells me it was in or above the kitchen area. At 9:51pm Cassie heard a “high pitched sound”. We never identified it. It was not picked up in the NightShot camcorder or the Tascam audio that was with us. We spent some time in the front left room and then at 9:55pm entered the living room. At 9:57pm I reported hearing teeny tiny snaps and pops or crackling. Bailey and Cassie did not hear them. This was not picked up in the NightShot or the Tascam audio. 9:58pm I reported hearing a thud sound from off in the distance (picked up in both the Tascam and the PX-720 stationary audio from the living room). I was the only one that heard it. The PX-720 actually captured two thuds and they are much clearer. It was not picked up in the NightShot. At 9:58pm the Tascam audio picks up a noise right before Cassie says “just for the record Bailey looks giant in that jacket”. It is also picked up in the PX-720 stationary audio recorder that was placed on the mantle in the living room and it sounds about the same as it does in the Tascam. From the NightShot camcorder it sounds like it could possibly come from Cassie before she speaks. Cassie does not feel like the sound came from her. Could it be a possible EVP saying “Hey”? At 9:59pm you can hear the taps and pops I claimed to hear earlier. Bailey heard it this time. Bailey reported that it was 50 ̊F in the living room. Her EMF reading was at the most a .1mG. From the center of the living room looking into the dining room, I imagined I saw something moving in the dining room. I realized it was some kind of shadow play or reflections between the door/windows and the add-on patio with more windows. At 10:01pm PX-820, the stationary audio recorder in the kitchen, captured a knock fairly close to the recorder. This was while investigators were in the living room. At 10:03pm Bailey reported a reading of 53 ̊ F. Then I announced that we were moving on to another room and anyone was welcome to follow us. Bailey then announced that she got a cold chill. At 10:05pm we moved into the dining room. At 10:10pm the Tascam audio picked up a possible voice in the background while we were talking about salvaging old woodwork. A few minutes earlier we reported hearing Norman and Linda’s voices from outside. This possible voice was also picked up in the NightShot camcorder, but not as audibly. At 10:11pm we entered the bathroom room. At 10:12pm Bailey claimed she heard something that sounded like music. No one else heard it. Then the bird flew into the room and we were distracted. It is not clear what Bailey was hearing. It was not picked up in the NightShot camcorder. At 10:14pm we’re out of the house. At this point, until investigators enter the house again at 10:40pm, the PX-820, the stationary audio recorder in the kitchen captured quite a few shuffling, thumping, and knocking sounds off and on. These sounds were fairly close to the recorder, which was placed next to the sink. At 10:16pm the PX-820, the stationary audio recorder in the kitchen, captured metallic scratching noises (in the pipes or under the sink?) fairly close to the recorder. There were a few similar noises a minute later. At 10:18pm, for about 30 seconds, you can hear the bird flying around and hitting the ceiling (I’m assuming) pretty hard. From the PX-720, the stationary audio recorder in the living room, it is clear that it was the bird. The same moment from the PX-820, the stationary audio recorder in the kitchen, was captured, but could easily be heard as shuffling from some kind of critter. At 10:22pm there was a knock and a pop captured in the PX-820, the stationary audio recorder in the kitchen. At 10:35 there was heavy shuffling captured in the PX-720, the stationary audio recorder in the living room. At 10:37pm there was some light shuffling captured in the PX-720, the stationary audio recorder in the living room. At 10:39pm there were two metallic sounding knocks followed by a creepy coyote howl, captured in the PX-820, the stationary audio recorder in the kitchen. We entered the house and spent a few short minutes in the living room and then the side porch addition. At about 10:45pm we moved into the bathroom room. At 10:46pm Norman heard something in the other room and wondered if it was the bird. At 10:46pm Norman heard it again. This time it sounded more like scratching coming from above. In the Tascam audio and the NightShot camcorder, both of which followed investigators, it did seem to be something shuffling or crawling around above. At the exact moment in the PX-720, stationary audio from the living room, you can hear the flapping of wings and it appears to be noises made by the bird. At 10:47pm Bailey ran out of tape in the video camera. We all decided to head to the front of the house together and wait on Bailey and a new tape. Norman later said the scratching sound was definitely not the bird and it sounded like someone “rolling a damn ball or something up there”. At 10:49pm the PX-720 stationary audio recorder in the living room captured a large amount of bird flapping and knocking. At 10:50 to 10:51pm I walked out onto the porch. Norman stayed in the front room to the right/”cold room” for a while and then joined me on the porch. At 10:53pm Bailey joined us on the porch and after about 30 seconds we made our way back inside. At 10:52pm some shuffling and a loud snap is captured on the PX-820, the stationary audio recorder in the kitchen. Investigators were in the front of the house and on the porch at this time. At 10:56pm Norman had made it to the kitchen and after taking a few pictures of the door by the connection, Bailey and I joined him. At 11:01pm Cassie yelled into the house that it was raining and the DVR got unplugged. We then made our way out of the house. We were out of the house by 11:02pm. At 11:04pm a tap was captured on the PX-720, the stationary audio recorder in the living room. No investigators were in the house. The following sounds were captured on the PX-820, the stationary audio recorder in the kitchen. No investigators were in the house. At 11:09pm we made our way back to the front entrance with our guest investigators. It was about this same moment where you can hear the sound of a gunshot in the Tascam audio from off in the distance as we’re heading in. It was also picked up in the two stationary audio recorders. No one acknowledged hearing it. Norman went immediately to the front room on the right/”cold room” and we wanted to see what the temperature was. It kept climbing as he stood watching the meter. Eventually the EMF was a .2mG and temperature was 49.8 ̊ F. I mentioned that at that moment I could maybe tell a little difference with the temperature in the doorway… but not as big of a difference as earlier in the evening and for sure the weekend before when I walked through with a property owner. Norman reported that the temperature was going up and down still…. 49.4, 49.6, 49.9, and 49.2 ̊ F. Later a 50.3 ̊ F … all in different places in the room. 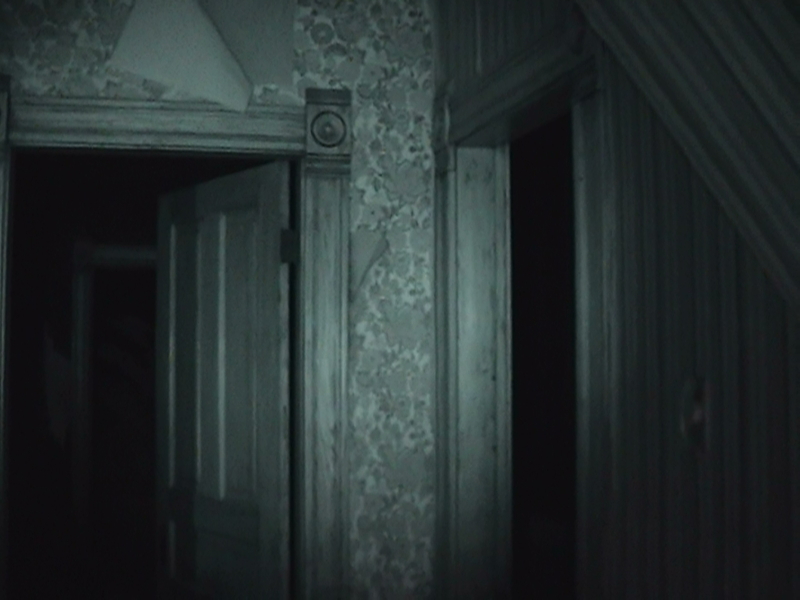 At around 11:14pm the NightShot camcorder picked up a possible EVP voice after “Can you make a knock?” My initial thoughts about this one was to assume it was someone’s stomach, but the camcorder is noisy and usually doesn’t pick up sounds like this. The Tascam audio records everything very clearly… but this sound was not picked up. Seconds later Norman reported the temperature going up to 51.1 ̊ F (and seconds later 51.2 ̊ F) and suggested it could be our body heat in the room. 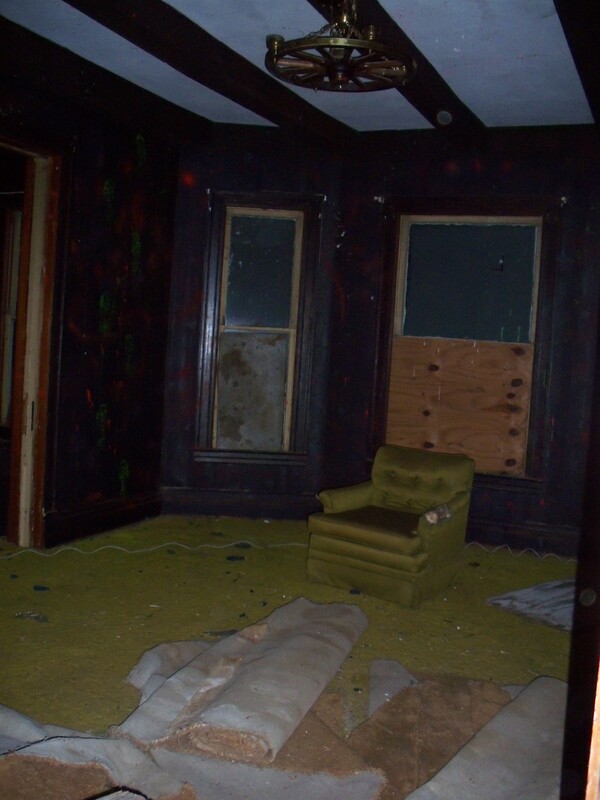 Later in the investigation, a property owner claimed that in this room she felt something move under her feet. She said it felt like someone shifted. We then moved on to the front left room. While we were all moving, at 11:15pm, the Tascam audio picked up what I believe could be an EVP saying what sounds like “table”. Was it an investigator’s voice? After checking the NightShot camcorder, I can’t hear anyone saying anything at that moment. Here is the same moment from the PX-720, the stationary audio recorder in the living room. The voice is not heard, but notice how loud the pop is right before Bailey says “In here?” The pop is right after where the voice saying “table” is on the Tascam, but the pop seems to not even be there. A minute or two later we all moved into the living room. At around 11:18pm we moved through the dining room to get to the bathroom room. We shined a flashlight up into the attic opening to see if it made anything start shifting (to get the sounds or movement we had earlier). There were no responses. We reported temperature readings of 52.1 ̊F to 51.9 ̊F in the bathroom room. At 11:23pm we made our way through the connection into the kitchen. 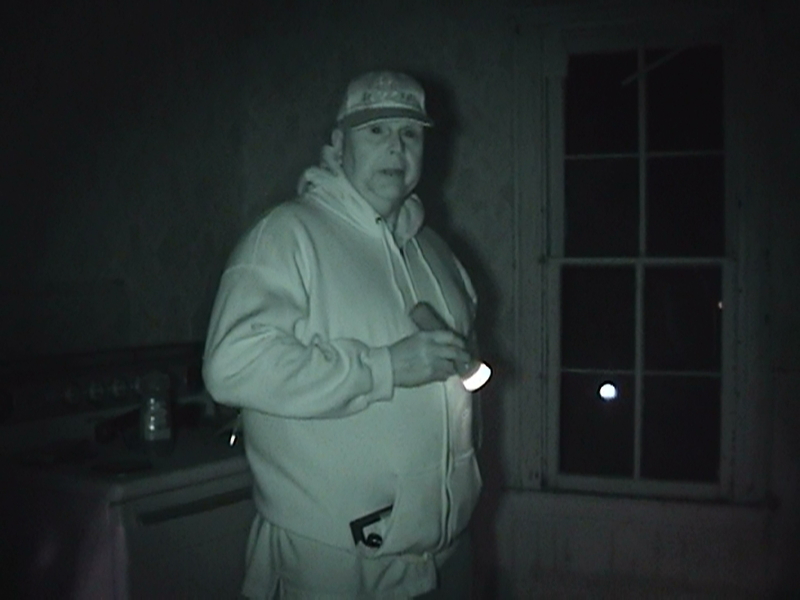 At around 11:28pm Norman and one of the property owners decided to check out the basement. At 11:29pm we made our way back through the connection and into the dining room. At 11:29pm the K-II meter that one of the home owners had been holding was flashing. She was already in the dining room. She said it went up to maybe the 4th light and then “skipped around” and then stopped. It flashed again a few moments later. She said she was thinking about going to the front right room at the moment it happened. At 11:31pm it did it again after I asked if they could do it again. I suspected it was possibly the DVR camera that was a few feet away from her, but we put it right up to it and it didn’t flash. I’m not sure we placed it right in front of the path of the IR beam though. At 11:34pm I saw it flash again as we were getting ready to leave the room. Again I mentioned I really thought it was because of the camera. Norman mentioned and noticed that getting close to the camera again it didn’t do anything. The Mel Meter was not responding at all. The fact is that the DVR cameras typically do cause the K-II meters to flash. They have caught us off guard several times in the past. I’m still skeptical about this one. We could all feel a cold draft coming through. At 11:36pm we made our way back into the front left room. Norman went outside because Linda radioed that it was raining outside again. At 11:39pm we were all out of the house. At 11:47pm the PX-820, the stationary audio recorder in the kitchen, captured two quick knocks followed by an unidentified sound or voice. I decided to try playing some trigger music (from 1901 to the 1940s) in the front hallway and “cold room” to see if we could get any communication or responses. For this experiment we used an iHome electric iPhone player/alarm clock along with my iPhone4. We ran an extension cord into the house from an exterior source, since there was no power. Our meters (K-II, Mel Meter, and later the Natural Tri-Field) were placed on the patio table near the center of the “cold room” and the iPhone and player were approximately 6 feet away and on the floor in the front hallway. 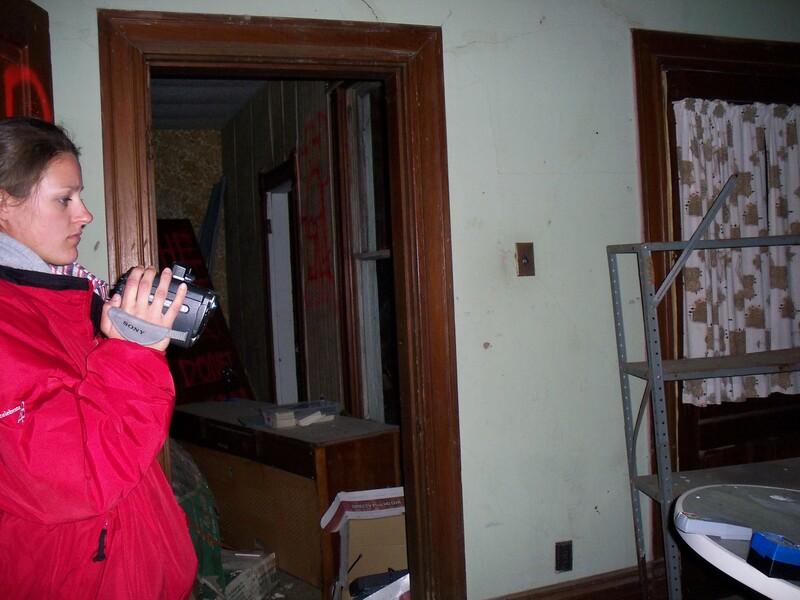 This was the only time we had any kind of phone on during the investigation. I thought for sure there would be no way of my iPhone giving off readings on the K-II meter at that distance. With the concerns I had about my phone and the extreme responses we were getting, I had every intention of later turning the phone off and continuing the experiment without the music, but as you’ll see below, heavy rain forced us to pack up and evacuate before the experiment was completed. I’m still not confident in saying the responses below WERE or WERE NOT caused by my iPhone, but I feel this experiment cannot be used to determine evidence of the paranormal in the house. We’ve once gain learned our lesson on having an iPhone anywhere near us for any reason in an investigation. With that being said, the events below are very interesting. See additional notes on my return visit on 5/27/12 at the end of this report. I tried the experiment again with an iPod and a battery operated player. Not long after we put the K-II on the table, it started flashing a few times on and off and is visible in the NightShot video at 11:56pm. It doesn’t appear that anyone in the room noticed. It is important to note that I was pushing buttons on the player when it flashed. There were times I was pressing buttons when it didn’t flash, however. I started the first track (Goodbye Dolly Grey, 1901) at 11:56pm. At 11:58pm you could hear me say “It just flashed”… but there was too much movement at that moment in the camcorder and it wasn’t captured. Later there were two small flashes, one at 11:58pm the other at 11:59pm. The Tascam was accidentally switched off not long after we started… it picks up again at the end of Goodbye Dolly Grey. At 12:01am there were 2 quick flashes right as When You were Sweet Sixteen (1901) started. Seconds later I experimented with pausing and restarting the music a few times. There were no flashes. After When You were Sweet Sixteen, I left Norman and Bailey inside in silence as I checked to see if one of the property owners was outside. I was gone for a few minutes. When I returned I asked several questions trying to get a response on the K-II, including asking for a flash if they wanted more music or if they liked the music. There were no responses. At 12:05am I played Ain’t Dat a Shame (1901). There were no flashes as I turned on the music. 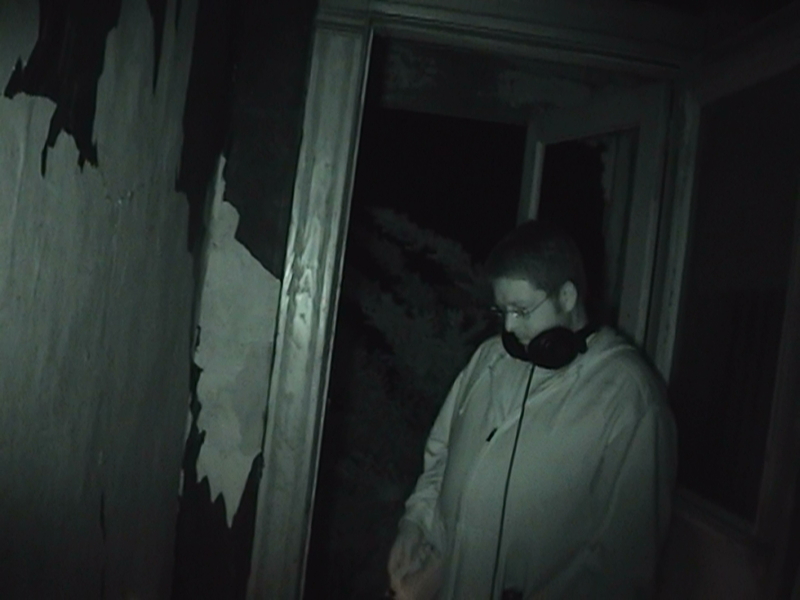 Bailey reported seeing a bigger flash a few seconds later, but it wasn’t noticeable in the NightShot video. At about the same time I reported a .7mG on the Mel Meter. None of the flashes seemed to correspond to any of my questions… not yet, at least. Any Old Place I Hang My Hat is Home Sweet Home to Me (1901) started at 12:07am. At 12:08am there was a quick but big flash during the music, and another a few seconds later (3 lights). I stopped the music to ask if they could do it again. There were no responses. We dealt with some radio technical difficulties for a few minutes and when I turned the music back on at 12:11am there were several flashes. Also at 12:11am, we decided to put the K-II right up to the player and the iPhone to test it. There were no flashes when I pushed buttons on the player. While I was talking, it started flashing multiple times. I began asking questions and there were just several random flashes. It flashed like crazy and very steady all of a sudden in the doorway. After a pause in the flashes I asked for them to go ahead and flash twice. We got two flashes, but then they continue and it went crazy at 12:14am. There were no responses after that until I started the music up. There were a few big flashes that seemed to coincide with me starting the player up… then a flash or two after that. Then, there was a single flash, rather appropriately on the last chord of the song at the end of the track at 12:16am. At 12:15am the PX-720, the stationary audio recorder in the living room, captured the bird and flapping noises. Some of These Days, 1911, started at 12:16am. At that time the Mel Meter read .7mG (but I was so excited about the K-II responses that I didn’t do a good job of keeping an eye on it for the whole experiment). At around 12:16 to 12:17am there was 1 single flash (as I was moving the Mel Meter up and down in the doorway). I mentioned that the readings got smaller the higher in the air I got. Seconds later, still during Some Of These Days, there were more flashes and a reading of .3mG on the Mel Meter. I asked Norman to move the K-II back to the table to see if it would continue to flash from there. There continued to be a couple of flashes. Then you can hear some feedback in the video (most likely from the iPhone) and there were a few small flashes at the same time. Why weren’t we hearing feedback before? About that time Bailey ran out of tape and I went to get another one while Bailey and Norman stayed. I think she got it back up and running before the end of Some of these Days. During that time Norman sat the Tri Field on the table with the K-II. We couldn’t see the readings though, but the alarm never sounded the whole time either. At 12:22am I played Swanee, 1920. After a while I paused the music to ask some questions. There were no responses during the entire song. At 12:26am I decided to go back to Goodbye Dolly Grey. There was no activity. At 12:27am I switched to Amazing Grace, 1922, and at 12:28am the responses started again. The K-II flashed like crazy for about 30 seconds. There was 1 final flash during Amazing Grace at 12:29am. I played Louis Armstrong’s When You’re Smiling, 1929, at 12:29am. There was one flash not caught on camera, and two more just seconds later at 12:30am. These were the last responses from the K-II that evening. At 12:31am I went back to Amazing Grace again to try to get more responses. At 12:33am I played Gene Autry’s Back In the Saddle Again, 1939 . At 12:34am we brought the K-II over into the doorway again to see what it would do. There were no responses to the music or questions. Dinah Shore’s Buttons and Bows, 1949, started at 12:36am. At 12:37am we noticed it raining pretty heavily. We left the audio and the meters running and headed outside to save command central and pack everything up. 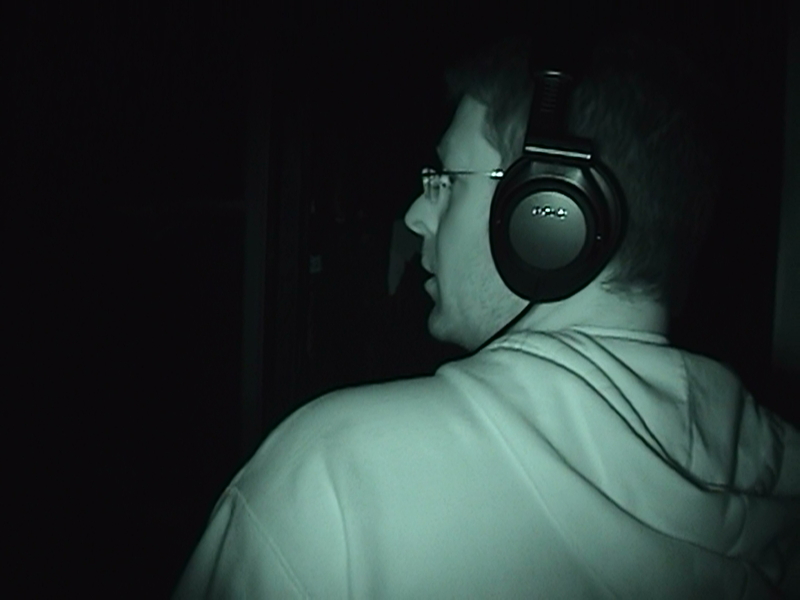 Before we left the room, at 12:38am the Tascam audio picked up an interesting sound or voice. At this point it is unidentified. At 12:47am there were several thuds picked up in the Tascam audio. Since we were all outside in the rain packing things into the car, it could be us. For the rest of the audio, there are a lot of unidentified sounds mixed in with the sounds of leaky drips, rain, and thuds as we pack up. The last recorder (the PX-820, the stationary recorder in the kitchen) was turned off at 12:59am. 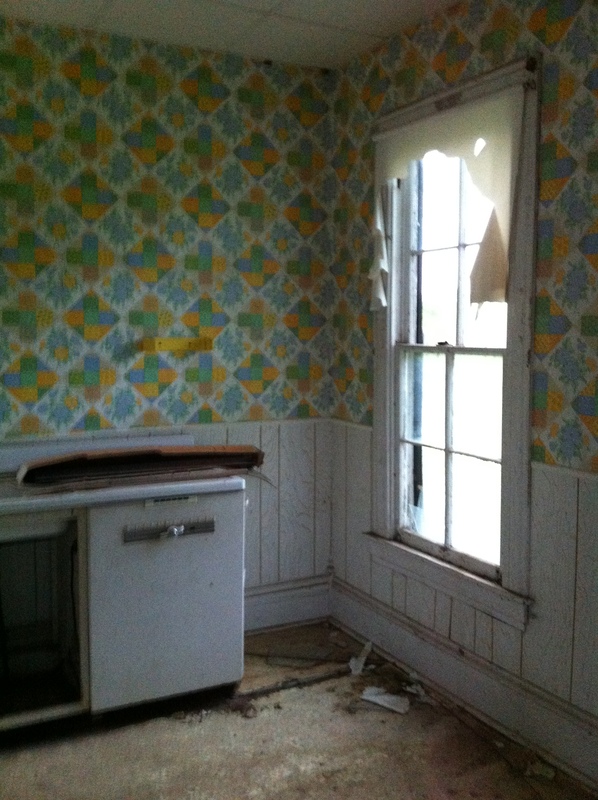 I returned to the farmhouse to try the trigger music and K-II experiment again. It was about dusk when I got started. This time I used an iPod with a battery operated player and a K-II meter placed on the same table in the same room. There was still no power to the house. I captured the whole thing with a NightShot camcorder on a tripod. I spent around 15 minutes trying to get responses and communication, sampling portions of all of the music samples that were played at the initial investigation. There were no responses at all. I did, however, turn my iPhone ON and OFF a few times to observe the K-II. There was a lot of flashing, even though I was several feet away. I am not entirely convinced that the events with the trigger music and the K-II during the initial investigation, was completely caused by my iPhone. I do, however, have some pretty good evidence that much of it really was. With that being said, what I experienced, and what you can see in the footage from the initial investigation, seems to possibly be intelligent responses and activity. Of course, at this time I can’t provide this as proof of paranormal activity. It may require further investigation.